I found a GREAT looking bag at ONA and it is designed by a photographer so it has all the inserts and everything. Google it or Facebook it. I was blown away. I can’t wait to get mine, but I will have to because it is pretty pricey. I also know that once I purchase it, I won’t have to buy another bag for a while, even with an upgrade in equipment. Its great to know I am not the only one with this problem… I have been shoving my srl etc in my eastport backpack for years while trying to come up with a bag that really works! I love some of the ideas you all gave and am going to give them a try. I’m so picky about bags and purses. And I’m sure not going to spend $150+ on a bag for my new camera. I love your purse in the picture. Perfect size for the necessities! And personally, I think the camera gets more love in a trendy stylish bag than in an ugly nerdy bag. I’m even thinking about picking out a nice purse and sewing in some dividers and foam of my own. from reading all of your comments I was happy with the Burton zoom pack its everything I’ve been looking for as a photography student in boston looking for a trendy camera bag and I liked the lowe pro comment because it is so true… part of the reason I want a back pack is so it doesn’t look like I’m carrying around a few thousand dollars worth of equipment and I think this bag will get the job done. Definitely think that’s the best way to go. Girls, I gave up trying to buy a pretty but practical bag. I just spent the evening cutting up a super thick yoga mat with some double sided tape to fit inside my mulberry Mabel and you know what?? It’s better padded than a run-of-the-mill camera bag and is the latest “it” bag in London; I’m happy. Well, I found you because I was searching for designer camera bags, so I gotta ask: did you EVER find anything you liked? I want something stylish and functional, and if you were in my same boat over a year ago, then I’m thinking their is definitely a need (and an opportunity). Wish I could sew! i’ve also been on the hunt and have seen pretty much all the above mentioned bags and haven’t really been happy with any of them. i have a crumpler, but i found i just stopped using it as it’s not really fashionable. while it’s great for a day out in the park or somewhere casual, it just doesn’t work for a night on the town, which is where i take a lot of my photos. i currently do, what it seems like most of us do… carry my canon 20D and an extra lens in whatever bag i’m currently carrying… with very little protection. definitely not treated with the loving care it deserves. i’m about to purchase a brand new camera and have been looking and looking for something a little more stylish. the shootsac while a bit more stylish wont work for the reasons that melissa mentioned above… and well the jill-e bags.. are kinda ugly. i think i’m gonna try making some sort of liner out of foam… although the suggestion for the built NY stuff was an interesting one. I just found this new bag designer that makes *reasonably* fashionable handbags with all the padding and configurability of a great camera bag. to carry my camera stuff and all of my regular handbag stuff. I took some inspiration from the shootsac and got these Built NY neoprene sacs designed for lunches and charging cables, respectively, to place inside the bag as protection for my camera from my other gear, and they were really inexpensive. I emailed the Shootsac people and while it looks cool, it’s not going to work for me for two reasons: the bag does not zip or offer any secure closure. It basically relies on gravity and the friction of your items in the neoprene to keep everything in place. The “flap” is not latched in anyway, and just keeps dust out but is easily brushed aside (again, not providing any closure). Additionally, the bag won’t hold a camera body with a camera attached. you can buy bookbags with room for flashes, lenses, multiple bodies, even your 17” laptop! plus, i have yet to see a bookbag this stylish built for photographers who also like to take along their computers. 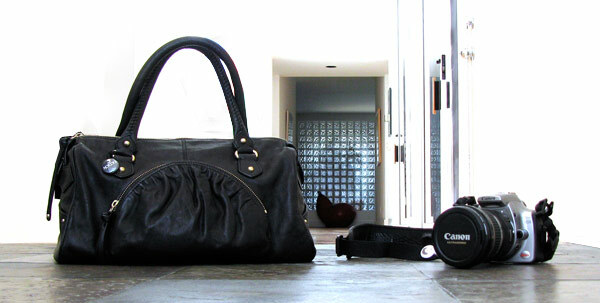 I lug mine around in my Burberry Nova Baby Bag - fits extra lenses, flash, battery pack - you name it! My best suggestion: Try getting a tighter fitting sleeve for your camera, like the kind of leather sleeves that came on your grandpa’s SLR, they still make them, but are harder to find. I personally bought myself a holster style bag, which is the smallest “normal” bag possible, which will also fit inside a larger bag :) Good Luck! I have been facing the exact same problem, someone needs to make a cool photo bag/laptop bag combo that looks nice. Right now I have a timbuk2 messenger with an insert I created from a cardboard magazine holder and some foam. The magazine holder pushes out a compartment for the camera. It works pretty well. I can post a picture later if anyone is interested. I suggest buying a nice looking bag, like this one, but at a lower price, and then “pimping it out” to suit your DSLR needs. All it takes is some foam padding and some brackets. I don’t like to go out into the wild without my D200, some glass, and a few flashes. What has become the best solution for me has been the Burton Zoom backpack. A rear entry (snark, snark, chuckle, chuckle)camera bag that is in conspicuous, roomy, and can come wakeboarding, skiing, or snowmobiling with me. Also good for use in the city if you don’t want the “LowePro Please Rob Me Now” logo emblazoned across your back. I’ve been looking into various options of late for a new everyday bag that will also handle my camera. Crumpler has a great line of foam padded camera bags that look like normal messenger bags. I’ve also been eying the Timbuk2 Hacker bag ever since I saw it posted on laughing squid. In order to avoid lugging my Canon backpack around until I get a significantly larger collection of lenses, I’ve come up with all sorts of tricks. I keep my 50mm and 35mm lenses in a cosmetics bag; I took one of the Velco padded dividers from my backpack and tucked it in between my lenses in the cosmetic bag. Then I put my camera in one of the small pouches that will fit the camera and its kit lens, with a small pouch for things like my wireless remote. Then I shove it all into one of my many oversized purses. However. That shootsac looks fabulous! Yeah, I actually just recently got a brand new D200 and have the same issue. My solution is that I don’t take it anywhere unless I’m going somewhere specifically to shoot - I just can’t risk it. Hi, Just want to drop a quick note that I enjoy your site a lot! As a designer,photographer, I always look for inspirations, and cool designs. Notcot is DA place for those. Anyway, my wife is a wedding photographer, and she bought this awesome camera bag from http://www.shootsac.com/ If you brwse their site, you will find how differet this bag is from other normal camera bags out there. First of all, it doesn’t look like camera bag at all, and you can choose the flaps from their collections. I think you will like it. My wife does. Hope this help. Thanks. I definitely do not handle my dslr like I should - I too am not satisfied with the current choices on the market for camera bags, so I usually try to shove my D70 into my suede, unstructured (read: not bump-proof) handbag. Then it’s “just” a matter of being really careful to not knock it around and finding space to fit my wallet and phone!